Are you getting tired of the penny pinching? Don’t give up! Use these tips to stay motivated to continue digging yourself out of debt. How Can We Stay Motivated to Continue Digging Our Way Out of Debt? Like a lot of people, we are trying to dig our way out of debt and it sometimes feels like it is taking forever. I sometimes ask myself if it pointless even trying. I’d like to hear any tricks and tips for staying motivated to push through from others who are either on or have been on a journey to becoming debt free. What do you do to beat those temptations to do a little internet shopping or splurge on a huge restaurant meal or put a weekend getaway on a credit card? We seem to get about five steps ahead when we give in and spend on something unnecessary that puts us two steps back. I see all kinds of advice for keeping motivated to lose weight. So how about some motivation and inspiration for losing debt? When I was in your debt situation, I made simple graphs on graph paper of my credit card balances. And each month when I made a payment, I’d connect the dots to watch the graph make a downward arc. If I messed up and bought something and raised my balance, it was particularly painful to see the arc go up instead of down. My diligence paid off and I am now debt free. Another trick that worked for me was to freeze my credit card in a container of water in the freezer. Before I used the card, I had to thaw it out, and by the time the card was thawed, the urge to spend had passed. Our family uses this idea to stay out of debt. We ditch the restaurants! If we are craving something different for dinner, we go online and find a new recipe using ingredients we have on hand. We also enjoy restaurant “copycat” recipes. Try Mexican, Italian, or Asian style cuisine for your next money-saving night in! I’ve been a follower of Dave Ramsey for several years now. The hardest step to take is the first. After that, walking is easy. Make saving your #1 priority for the things you want to experience. Use the envelope system to put away a certain amount of dollars per week/month for eating out, shopping, etc. It is so much fun to look forward to spending the time doing what you want, when you want, and can truly afford without putting yourself back in debt. The only major debt I will have after the summer is student loans with a plan to eliminate them in 1.5 to 2 years. It can be disheartening trying to get out of debt but don’t give up. Like everyone, we were in debt but we pulled up our socks and said enough! Try to keep in mind this is probably the most important task you can do for yourselves and the end game is huge. I know because we made it and life is so much better for it. We have no debt now! We own everything we have and never worry anymore. Try to find ways of rewarding yourself without adding to the debt load. For example, for our anniversary, I asked for a pass to our local national park. Then I made good use of that pass. We would picnic there once a week and walk on the beach. For those few hours, it felt like we were a million miles away. Also, we spent time with friends doing a potluck dinner and games. I saved any change left over from my weekly budget. Then I used it after it grew for whatever I wanted. I still do this and will soon be going on a very expensive vacation with it. You can do this! Don’t give in to short-term wants. Instead, keep your eye on the big prize. A goal thermometer with $0 amount at the top and the total debt amount at the bottom is a good visual aid to motivate and track debt pay-off progress. At regular numerical intervals on the chart, a small reward should be noted and this reward is to be enjoyed as soon as each pay-off goal is reached.Here is an example of a thermometer template to print and then customize. 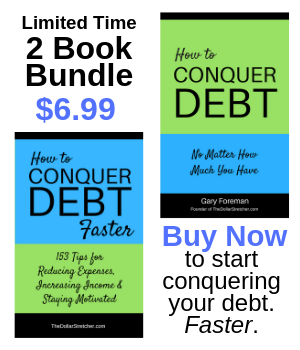 “Debt Freedom” is an example of a title that can be used for the chart. Be sure to display the chart where you will see it daily. I made a game out of not spending. For every dollar I spent, I had to earn $1.50. I decided by the time I paid income tax on the money earned, sales tax when I spent it, and the expense of earning the money in the first place, it probably added up to 50 cents. (It was also easy to calculate.) This “game” not only stopped or slowed down spending on small “it’s only a dollar” things but on larger amounts as well. Somehow that $10 item didn’t look so good at $15, etc. How Much Will I Have to Work? One way to help cut down on unnecessary spending is to take what you make per hour and figure out how many hours it will take to purchase that item. If you make $15 per hour and an item costs $150, it will take you 10+ hours (after taxes and such are deducted) to purchase that item. Is it worth 10+ hours of your time to purchase that item? I answer that “deprived” feeling by going to a dollar store. The deal I have with myself there is I can buy 25 things, no matter how much I don’t need them. I come home with my treasures and feel really indulged without doing a lot of damage. A couple of years ago, we opened a checking account that charged $1 with every debit transaction and online transfer. Each $1 charged against the checking account went into the savings account. We usually accumulate about $30 to $40 per month that we use to apply against debt or use for eating out. This is a forced savings that we chose when we opened up the accounts. Another option is to round up to the next dollar (or more) on your own in your checkbook and keep a running account as you go so you know just how much is being saved toward a specific goal, such as eating out or a splurge purchase. You will also need to keep track of this, so balancing your checkbook will be easier. I used to do this years ago. I would use black ink for the amount of the actual transaction and red ink for the rounded up portion next to it and a running account of the “red savings” in the margin of bank register. This made it simple when balancing my checkbook to my bank statement. We used the extra saved money for either extra debt payment or for special occasions. We were never very good at saving actual cash for the same thing as it somehow just “ran through our fingers,” but keeping it as a cushion in the checking account was easier for us. Related: Is Debt Consolidation a Good Idea? When I was reading this, I was reminded of when I quit smoking (1986). I convinced myself that if I ever picked up one cigarette and took one puff, I would go out and purchase a carton of cigarettes and be just as addicted as I was before. I think with credit card debt, you might use this technique. If you should charge just one thing, whether it’s an internet purchase, a meal out, or a treat of some sort, convince yourselves that you will be back at Square One and you’ll have to go through this entire “deprivation” scenario again. Good luck to you! I’ve been a non-smoker since 1986, and it was the best thing I ever did for myself. May getting out of debt be just as powerful for you. Related: What Does My Debt Cost Me? There is a 12-step group called Debtors Anonymous, which can provide a lot of support and help. You can find the group on the internet to get a schedule of meetings and contact information. The best motivation I have to get out of debt is to keep telling myself that becoming debt free is the same as getting a raise. By not being indebted to the credit card companies, I will suddenly have more money left over per paycheck, and that is priceless! I also have to keep in mind that when I live off of credit, I am paying more for everything I buy because I am being charged interest. My paychecks are being eaten up and can’t be stretched as far as they should. Alcoholics don’t hang out at a bar, and internet shopaholics shouldn’t hang out at Amazon, eBay, or wherever their temptations exist. You should do absolutely no window shopping! Instead of killing time walking around the mall on your lunch, go walk around the park (you’ll walk faster and burn more calories) or visit the library or local landmark that is free. Find other distractions/hobbies that are free/low cost (reading, cleaning out closets, etc.) Just substitute!